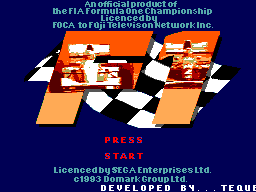 In my opinion, from a gameplay standpoint, there is no better racing game for the Master System than F1. A bold statement to make, but then when you think back to some of the names mentioned already many of the previously released racing games were actually pretty terrible, or had aged very badly by 1993. The only other competitor to this game, Ayrton Senna SMGP2, tends to split the board amongst racing game fans, as it did the reviewers at the time - some giving it as low as 50%, others as high as 93%. F1 has a great feel to it from the onset, the opening screen can be seen in the screenshots here, and you can see it looks very impressive. There are options to race in Arcade mode (where you race over each track consecutively having to finish 8th, then 7th, then 6th etc. to make it to the next round. Then there is the championship mode where you can set up your car differently, and have to try and win the world title by scoring more points for higher finishes in each race. The racing is very smooth, and actually gets you moving from side to side as you play the game and try to will the car to stay on the track! (Cummon, you know you do it, it aint just me!!!). The graphics, whilst not dazzling, do the job nicely. Unfortunately, we get no 'behind the steering-wheel' view, but the traditional 'behind the car' one. However this doesn't make the game any less impressive, as the other graphical elements make up for it. The game has a genuine feel of speed, something that can't really be said about many other 8-bit racing games, and simple things like the markers you pass going round corners help to convey the speed well. 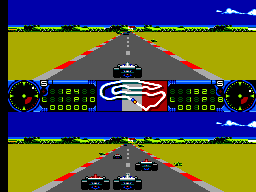 For the first time in a Master System racing game, a hill on the track is done very well, and the split-screen two player mode is handled very well indeed. Also in terms of graphics, the map to show you where you are on the track at any time is very good, and alerts you as to where you are and what's coming up. Finally, the graphics are all very bright and colourful, nothing dull and wishy-washy about this game! The sound is actually ok in F1. It isn't astounding, but it isn't ear-bleedingly bad either. The opening tune is pretty poor, but it is inoffensive, and the sound effects during the game are all appropriate and relatively well done, especially the acceleration and the tyre screeching as you round a tight corner. So it isn't great, but definitely better than average. The controls in F1 are amongst the best for any racing game for the SMS. One button to accelerate, the other to brake and the D-Pad to control your direction left and right. All very responsive, and everything does what you tell it to. If you're fortunate / Unfortunate enough to have a handle controller (it's a steering wheel type thing for anyone who doesn't know what I'm talking about! ), this is one of the few games it actually works for! It is difficult to master controlling the game this way, but that for once isn't a bad thing! As the game is quite easy to begin with, the handle controller makes it that little bit more difficult, and challenges you to be that little bit more accurate! 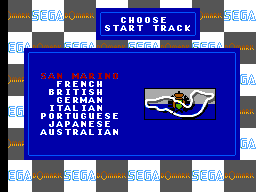 The best Formula One game for the Master System without a doubt. A feel of speed, a lot of tracks to choose from, different game modes, and a split screen two player mode. You can even play - spot the driver who hasn't retired yet! What more could you ask for?? ?